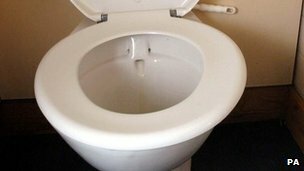 Residents of Zimbabwe’s second city are being asked to all flush their toilets at the same time, to prevent sewage pipes becoming blocked. Bulawayo Mayor Thaba Moyo told the BBC that the force of the “big flush” would keep the pipes open. A severe drought, on top of years of poor maintenance, means that Bulawayo residents often go without running water for three days at a time. The first synchronised flush is due at 19:30 local time (17:30 GMT) on Monday. Mr Moyo said that the lack of water in the sewage pipes had already led some to burst. He said the “big flush” would keep the pipes wet and so prevent them getting clogged up. “Everybody should flush water at the same time,” he told the BBC’s Focus on Africa programme. The BBC’s Thabo Kunene in Bulawayo says that most houses in the city, even in townships, do possess toilets which flush, unlike in many African countries. But he says that due to a lack of water, many people have been using buckets of water instead. The suggestion has had a mixed reception in the city. “I don’t think the exercise will be a success because when the flushing comes at 7:30, many townships would be without water,” Bulawayo United Residents Association chairman Winos Dube told the BBC. “Our leaders are a joke,” said Petros Ncube. “What they should be doing is finding money from donors to buy new sewer pipes,” he said. But Nothando Moyo (no relation to the mayor), a resident of one of the city’s largest townships, Cowdray Park, said she would take part.